Club Scion tC - Forums - What Got You Into Cars? Just like the title says, "What Got You Into Cars"? He'd also take me to the illegal street races in the inner city Chicago neighborhoods. The cops showed up and prevented one racer from getting back to his vehicle when it was near a fire hydrant, the officer opened the car door of the Honda and then he opened the fire hydrant right into the Honda flooding the entire car. anyway, that's my story, what's yours? Hmm. I'm a Daddy's girl and so him and I built cars together when I was younger, and I always hung out with guys (besides my dance team and sorority) outside of school and dated guys that were into cars, so it all just rubbed off on me. Plus, I like for guys to be like "woahhh she knows what she's talking about "
My uncle was a amatuer stock car driver, back in the day my father, uncle, and their friends used to run. I get sh*t all the time cause "You know my boss stang (uncle's ride), or mach 1 (fathers ride) used to run 11s?" my brother got me into cars. he had a 12 sec mr2 and i loved that thing. he let me help install parts on his car which helped me learn a few things. his racing crew used to race at cmi in sacramento alot and they all drove mr2 turbos, 300zx tt, vr4, s2k, a supra tt, turbo hatch, turbo integ and some other things. but that is what really hooked me into the car scene. my brother also helped me buy my first car which was a gsx, which at its best ran 13.7 with minor mods and a 16 year old driver. nowadays, my bro and all his friends have families, and drive mercedes and bmw's so now i gotta try and carry on what my bro has introduced me to and what i have come to love. This is definatly going to date me, but when I was an early teen I went and saw Smokey and the Bandit...guess what my 1st car was, LOL. I would say my Daddy. I too am Daddy's Little Girl. I'm the only child so I guess part of him always wanted a boy. He taught me how to play video games, how to drive [he would put me on his lab at the age of 8, lol], & how to drive stick. 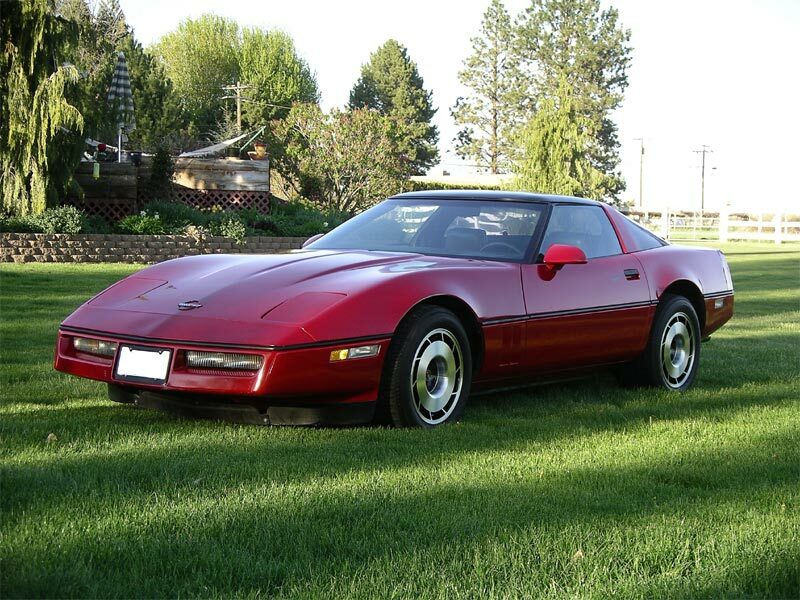 I remember my fathers bright red 1987 Chevy Corvette. That was his baby!, lol. Ever since I saw that car as a little girl I was into cars. He would put me in the front sometimes, buckle me in, and do 130 in the car, and I use to lovvvvvve it.. lol. When I bought the tC I didn't have any intentions of modding it at all. I was gonna get it tinted, and maybe get a different head unit. Then I met up with these crazy people in a club called Scinergy, and I got to talking to them. Two weeks later, my car had a Weapon R SRI with the cold air box, and a week after that it was lowered on Tein H Techs, and a RAM air kit was added At that point I was bitten, and haven't looked back since. I remember my fathers bright red 1987 Chevy Corvette. That was his baby!, lol. Ever since I saw that car as a little girl I was into cars. My friends were into cars and I was always facsinated with cars. I can remember being a kid and longing to have my liscense just so I could drive. I used to watch my Dad drive stick and pretty much knew what to do before he "taught" at the age of 13. It is a paaion for me and it isn't something I will ever grow out of. My life pretty much revolves around cars! When I bought the tC I didn't have any intentions of modding it at all. Haha, I think Im pretty much with you there! All you guys are pretty lucky to have really cool stories about your car interests. Before I got my tC, I had little interest or knowledge about cars. Well, atleast now I can say I have the interest, and am definitely working on the knowledge! As cheesy as it may sound. This site got me into cars, when I first bought my car I was just looking around and stumbled upon this site. Once I found this site, I found all these great people and learned a lot. Because when I started it was either learn about cars or computers and those who know me, know I was one to choose computers. but this site has taught me so much and if it wasn't for the users I don't think I would have ever logged on here as much or learned as much, I am normally not the type that likes forums but this is my exception. I've just had a fascination w/ cars all my life, as a newborn I was taken for a ride if I was cryin' too much. Family trips we're almost always in cars. Then mom made the mistake of buyin' me Hot Wheels. My grandma went from an AMC Gremlin to a special ordered,(by another customer), early 70's Firebird w/ the 400 c.i. engine outta the Trans Am. White w/ a blue interior. Mom's first car was a '71 Vdub super beetle. Thru Jr. High I was told it would be mine when I turned 16. Then I started reading VW Trends and Road and Track and the addiction was started! Then I was finally able to have what I always wanted... a driver's license. The ending of "Gone in 60 Seconds" When I saw that Shelby GT500 something hit me and ive loved cars ever since. Plus all of my friends are very into cars and all of us modd our own. 2 of us have tc's, a honda civic si and the rest have muscle cars. My best friend has a mach 1 mustang my other friend has a bullitt nad then my other friends have camaros and one has a 79 trans am. The mach 1 and bullitt are in my profile pics. Oh man, I remember it like it was yesterday. My oldest brother took me for a ride in his blue notchback convertible mustang. It was a 302 with a supercharger in it. We were just driving down the road going somewhere and he got on it for whatever reason, after that it has all been down hill since. It was like Talladega Nights all over again ".... I wanna go fast ...."
Hahahaha! I went to see that movie at the theatre like everyday the first week it was out! I bought the matchbox version. And I still sing East Bound and Down! Motorsports Racing: What are you into?